Rapid growth for Nuvias as partners invest in the company’s vision for consistent, solutions-defined distribution across EMEA. Woking, UK: 24/4/18 - Nuvias, the fast-growing value-added EMEA distributor, has opened a 13,504 sq. ft. new EMEA HQ at Woking, Surrey. The move is the latest step in the rapid growth of the company, following its foundation in 2015. 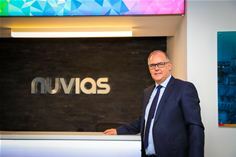 Turnover at Nuvias is now in excess of US$ 500 million, with an increase across the board of some 13.1% in the last financial year. The Advanced Networking and Cyber Security Practices each increased by 12% and the Unified Communications Practice by 18%. Nuvias has attracted many new vendors, and extended its reach with existing vendors, all keen to take advantage of the company’s ethos, strong commitment to growth across EMEA, and ability to provide a consistently high level of value-added services across the region. New vendor partners such as Juniper Networks, Nokia, Malwarebytes, HID Global and BlueJeans have enlarged the Nuvias solutions portfolio; and existing vendors have extended their scope in EMEA with Nuvias, including Riverbed, Lifesize, ProLabs, Broadsoft, Polycom, AudioCodes, Oracle, Panasonic, Snom, VASCO, WatchGuard, Barracuda, Tintri and Kemp. Since its foundation, Nuvias has also extended its geographical reach with new offices in Austria, Switzerland and South Africa, as well as upgrading Nuvias regional hub locations in Dubai, Germany and France. The company has won many press and vendor distributor awards in the last couple of years.